Soundmatters foxL v2 Bluetooth speakers promise audiophile sound | What Hi-Fi? Take a look at two new ultra-portable Bluetooth speakers, the foxL v2 Black and the foxL v2 Platinum. Both measure just 14.5cm wide by 5.5cm tall and support wireless music from any Bluetooth device, but the Platinum has superior aptX Bluetooth support and a larger battery life. The Soundmatters foxL v2, distributed in the UK by Musical Fidelity, claims to be a portable Bluetooth speaker for audiophiles. Two patented 1in 'Magnetic Drive Twoofers' claim to deliver a level of sound quality 'well beyond any similar-sized speaker'. There's a patented FlatMagic subwoofer inside the speaker, too, taking care of low end frequencies. A rechargeable battery is good for 12-hours on the Black model, or up to 20 hours on the aptX Platinum model. Both are recharged via USB. 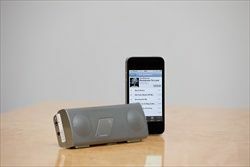 The speakers have a 25-30m Bluetooth range and can act as a speaker for voice calls as well as playing music from any phone, tablet, computer or other Bluetooth device. The Soundmatters foxL v2 Black costs £169, the foxL v2 Platinum is £209. Both are available to buy now.